Whispers in the Loggia: STEELERS WIN -- PARTY AT TOBIN'S! STEELERS WIN -- PARTY AT TOBIN'S! With congrats to Steelers Nation, the Vince Lombardi trophy has returned to Pennsylvania for the first time since they won Super Bowl XIV in 1980. As our tribute, we're happy to run the following encore presentation from last 22 December, when Whispers introduced the world to the Primate of Episcopal Steelers Nation, a lead followed shortly thereafter by the mainstream press. Looks like Tom Tobin's fervor has been rewarded tonight...... I'll put down money that a gold and black flag is going up over the Providence chancery in the morning. If the Boss gets any sleep, that is. Nice house, no? 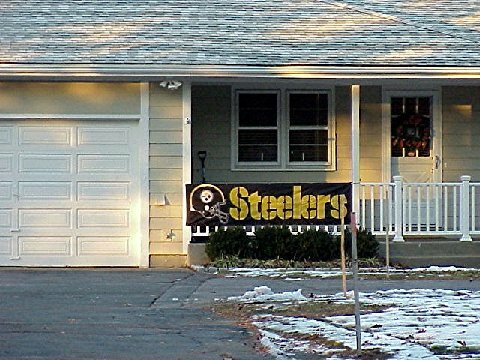 With that little banner out front, looks like a sleepy little McManor in suburban Pittsburgh, home of the Steelers (the favorite team of generations of Franciscan capuchins who studied at St. Fidelis Seminary there). But here's the rub: It's not Steel City. This is the residence of Bishop Thomas Tobin of Providence, a native Pittsburgher sent to the heart of (the Steelers' AFC archrival) New England Patriots' country as John Paul's last American appointment before his death. For the rabid Pats faithful, who've become a championship dynasty under coach Bill Belichick -- to the point of taking out my beloved Eagles at last season's Super Bowl in Jacksonville (well, the Birds took themselves out, but still...) -- this is the closest thing to a mortal sin there is. Well, even though it's bad manners to take your home team to your new assignment, it's good to know that at least one cleric has got bigger things on his brain than the resurgent camauro.